Vietnam is always famous for beautiful sciences, diversity in culture and simple lifestyle of local people. If you come to Vietnam, you shouldn’t miss two famous destinations in here like Danang and Hoi An City Tour as their interesting. 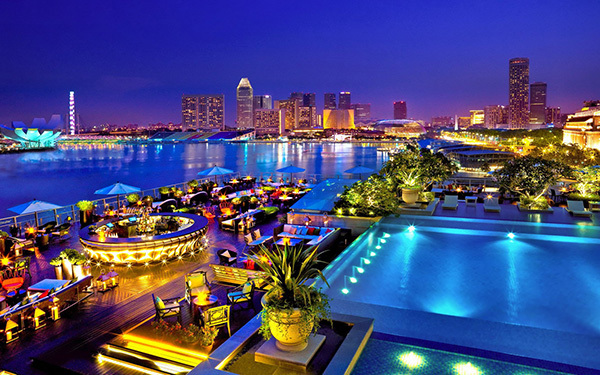 Da Nang is located in the South Central region of Vietnam, which is a major center of economics, politics, culture, society, education, and training, science, and technology of the whole country. Hoian is known as “peaceful meeting place” as it brings to you when you experience here. Besides, owing to the close distance, tourists can easily visit Da Nang and Hoian together in around 4 days and 3 nights. 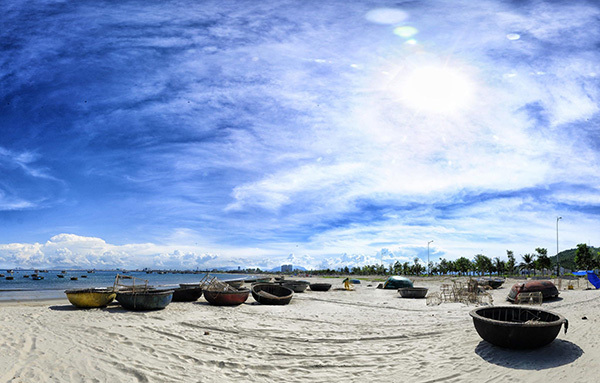 Danang is considered the best place with harmony weather, charming landscape, and dynamic lifestyle. Not only well-known for potential business development, Danang is also an attractive tourist spot that visitors “must-go” in Vietnam. Bana Hills is one of the most attractive destinations in Danang. You have just caught up Bana Hills, you will enjoy the weather with a cool climate with spring in the morning, summer at noon, fall in the afternoon and winter in the evening. The cable car system at Bana Hills was completed in 2013 and holds several Guinness World Records, including the widest gap between stations and the greatest change in elevation. The views of Danang and the coast in the distance are spectacular. 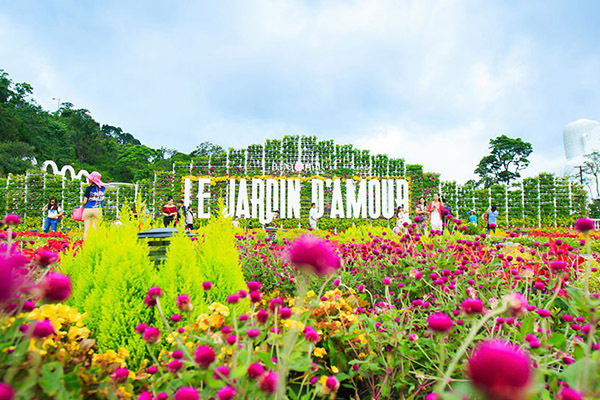 Firstly, Le Jardin d’Amour flower garden was inspired by the French architecture. It is created by the natural landscapes and the climate of Bana hill. Bana is created by small gardens possessing sweet names such as tryst square, lovebirds garden, Eden, etc. Secondly, Debay was built by the French since 1923. It is being devastated by bombs, this unique wine cellar has been restored for a long time. The wine bar in this cellar was the place where villa owners or property owners enjoyed and treat guests in the old days. In the journey to visit this wine cellar, you will enjoy a glass of wine. Fourthly, Linh Ung Pagoda is located at an altitude of nearly 1,400 meters. Clearly, the Buddha statue is majestic with the height of 27 meters, meditating on the lotus of 6 meters high. Fifthly, have you ever wondered what some of the most famous people in the world look like up close? Well, at the Bana Hills Wax Museum, you get to see some rigid approximations. That is about as close as we’ll ever get without getting a swift beatdown from security. Sixthly, this game area is offering many entertainment activities: from strong feeling games to indoor climbing challenges at the height of 21 meters and light games. The modern technology of 3D, 4D, and 5D cinemas brings the truest and most lively experience with the 7th art. Additionally, a lot of fun recreational games will help your fun moments with friends. Finally, located in Mercure hotel looking like a massive, it is hidden inside a swimming pool with exclusive architecture style, reproducing the luxuries of European nobility since the ancient times. The outside world first heard about My Khe Beach from American soldiers home on leave from the Vietnam War. It got its name from troops who enjoyed time off relaxing on this beach near Danang in Central Vietnam. There are many interesting outdoor activities in My Khe such as sunbathing and water sports. And Americans love their surfing and this beach is a great place to go today for those who want to indulge their passion in water sports. Coming to My Khe beach, you will be experienced in the large number of water sports including a selection of both fun or challenging sea activities can be booked on the spot. For example, banana boats, water skiing, wakeboarding, parasailing, jet skiing, windsurfing, and kayaking. If you are really confident on a motorbike, you can move from Danang to Hoian. It’s a 30-kilometer drive along the coastal road, giving you the option of a stop at the majestic but rather Marble Mountain. You can get your bearings of the city from one of the highest viewpoints on the coast. Then you can drive your motorbike to Hoian town. Another option for you is choosing the tour from Danang to Hoian. You use comfortable sedans or vans with air-conditioning. The comfort and safety of our customers are of utmost importance, so we ensure that all of the vehicles that we use are well maintained and always very clean. Firstly, Welcome to Cu Lao Cham is one of most attractive places in Hoi An city tour. Not only that, it is famous for long white beaches, turquoise waters, and delicious seafood. Cu Lao Cham Island is located in Quang Nam, about 15 kilometers from Cua Dai Beach. There are eight smaller islands in Cu Lao Cham, including Hon Lao, Hon Mo, Hon Dai, Hon Kho Me, Hon La, Hon Tai, Hon Kho Con and Hon Ong. 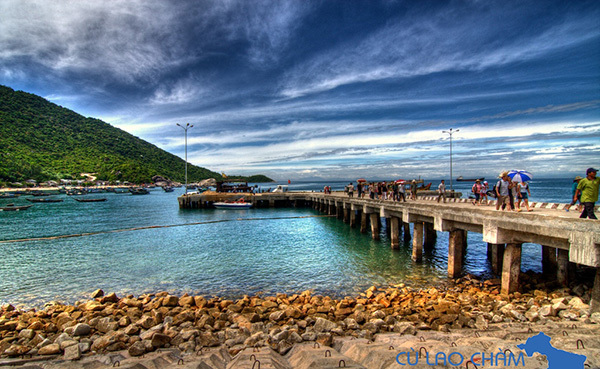 The period from March to August is an ideal time to take trips to Cu Lao Cham Island. Why? because it is the best weather as it is warm with beautiful sunlight, turquoise waters, and gentle waves. It is a suggestion not to travel in the rest months because it will have heavy storms. Cu Lao Cham Museum is the historical place where keeps traditional customs and habits. By dint of the good arrangement of artifacts, travelers can understand more about the culture of this land. One suggestion for you is to participate in snorkeling activity. You’ll get a more professional experience, good equipment, and a Dive Master looking out for your safety. Finishing Cu Lao Cham island, you get the awesome feeling in the serene and pristine beauty of nature, continuously coming to Hoian ancient town. Graceful, historic Hoian is Vietnam’s most atmospheric and delightful town which was listed as a UNESCO World Heritage site in an effort to preserve its core of historic architecture, a stunning mix of Vietnamese, Chinese, Japanese, and European styles in 1999. Hoian attractions include the centuries-old Buddhist pagodas, colonial shophouses, and quaint museums. Hoian was declared a UNESCO World Heritage Site thanks to its well-preserved mix of Vietnamese, Japanese, Chinese, and French architecture which is the important Vietnamese trading port between the 15th and 19th century. The Japanese Bridge was built in the 16th century which is covered bridge in the world to house a Buddhist temple, and known as a symbol of goodwill between Chinese and Japanese merchant communities. Hoian is covered by a lot of interesting like lush, green countryside, and it would be a shame not to venture out of the city during your stay. When you ride the cycle you have an opportunity to experience in the rice paddies, hills, villages, and pristine beaches. If you want to get more experience in here, let’s hire a vehicle and try a day trip out of the city, and perhaps even head north to nearby Danang, where the beautiful Nui Son Tra peninsula is located. 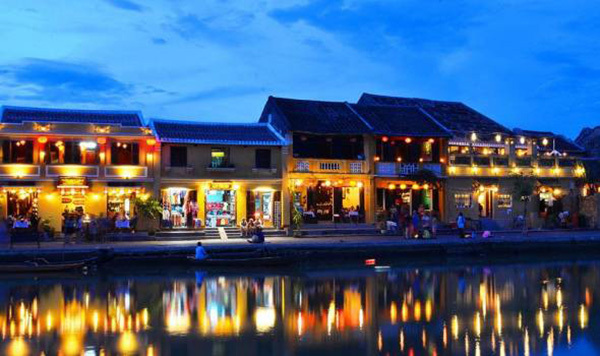 Hoian is home to one of the most attractive night markets in Vietnam. There are a lot of lanterns of all shapes, sizes, and colors, made of the famous Hoian silk, which is displayed here almost every night. You are comfortable to purchase the souvenirs, but you should bargain with cheaper price. The sight of thousands of lit-up lanterns in the dark is well worth the river crossing. Next, one recommendation for you if to join in the Lifestart community which is a non-profit charity organization. Especially, you will learn life skills through handicraft. The mission of this tour directly supports disadvantaged of members of the community. Continuously, My Son Sanctuary is one of the most sacred places in Vietnam. As a result, your tour guide will talk to you the historical stories of My Son Sanctuary. Vietnam’s most important site of the ancient kingdom of Champa is My Son Sanctuary. Recognized as a Cultural Heritage site by UNESCO in 1999, My Son is an attractive destination for both of domestic and international tourists to visit and learn about the culture and history of Champa Ancient Kingdom. There are a lot of Champa temples surrounded by two mountain ranges. This place was also a burial place of Champa royals and national heroes. The My Son temple complex is the foremost heritage site of this nature in Vietnam. Actually, it has been destroyed for a long time, you still see many majestic ancients of temples in the area.